020918 - Senator Elder Vogel, Jr. Earlier this week Governor Wolf unveiled his budget plan for the 2018-19 Fiscal Year before a joint session of the General Assembly. I look forward to working with Governor Wolf and my colleagues in the General Assembly over the coming months to deliver a balanced and responsible state budget. I plan to take a closer look at the $1.2 billion spending increase proposed by Governor Wolf. I agree with the countless constituents of my district who insist that we must find greater efficiencies in state government instead of taking money out of their pockets. As the Chairman of the Senate Agriculture & Rural Affairs Committee, I am happy to see that the budget for Agriculture has not been cut to the extremes it has been in past budgets, but there are some critical areas that will need restored. I am also pleased to see a proposed increase in education funding including science, technology, engineering and math (STEM) initiatives and for career and technical studies. Focusing on job preparedness in our younger generation is imperative. The Governor continues to push a severance tax on natural gas extraction which I find to be troubling. I have personally seen the loss of jobs in my district as natural gas companies have been forced to lay off workers due to low gas prices and policies that inhibit progress. Natural gas companies already pay hundreds of millions of dollars in state taxes and have paid over $1.2 billion to municipalities through impact fees since 2011. Jobs and livelihoods depend on the natural gas sector. We should not pass another tax that will chase them away. During Appropriations hearings over the next several weeks, the priority will be finding out the details of this budget to ensure our state taxpayers are protected from wasteful spending. Thorough vetting by the Appropriations Committee is required and I look forward to determining what is best for our taxpayers and the agricultural community. The Senate Appropriations Committee will hold a three-week series of Departmental Budget Hearings beginning on February 20. For more information or updates on the budget please follow this link to the PA office of the Budget website. 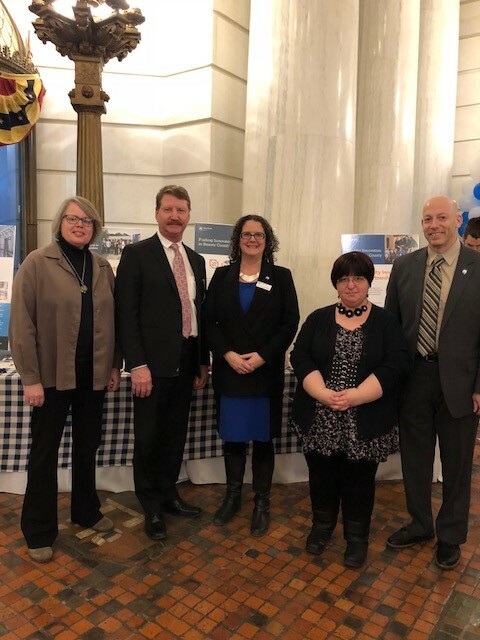 Great to see these folks from Penn State Beaver at the Capitol highlighting the Invent Penn State Innovation Hub, an entrepreneurial program being offered. The Senate Banking and Insurance Committee approved my Telemedicine Legislation on January 30th. 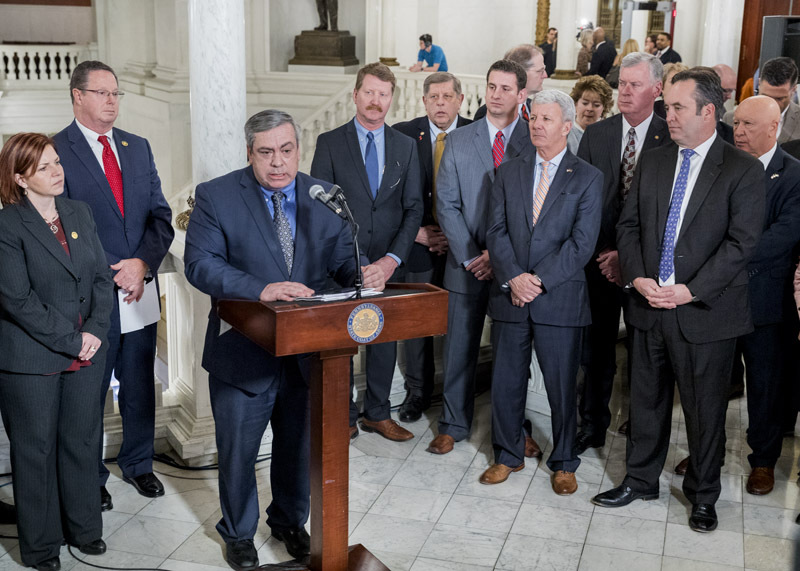 Senate Bill 780 is aimed at promoting telemedicine in PA as a way to overcome barriers to quality patient care created by distance and reduce the cost of those services. This bill defines telemedicine and establishes guidelines regarding who can provide telemedicine services, and provides clarity regarding insurance company reimbursement for those services. Telemedicine is transforming healthcare and it is something our state should embrace. Through the use of telemedicine, specialists and other health care providers are able to expand their reach, helping patients stay in their communities and avoid traveling long distances for specialized care. This will not only save costs, but it could save lives. The bill establishes the services that are covered by insurance for in-person visit would also be reimbursable for telemedicine, but the measure gives insurers latitude in determining the amount that is reimbursed. I am proud to say this bill is supported by the Hospitals and Healthsystem Association of Pennsylvania, Pennsylvania Medical Society and AARP. Senate Bill 780 now passes to the senate floor for consideration. For a quick audio clip of what I’d like to accomplish with this legislation please click here. For more information or updates on this bill please call my office at 724-774-0444 or contact me on my website by clicking here. The Pennsylvania Fish and Boat Commission has released its 2018 Trout Stocking list. The format is similar to past years, with the schedule grouped by county. The PA Fish and Boat Commission still plans to stock approximately 3.2 million trout throughout Pennsylvania in 2018, and their statewide network of cooperative nurseries are expected to stock nearly 1 million more trout. There should be plenty of fish in the water for Pennsylvania anglers to get excited about. 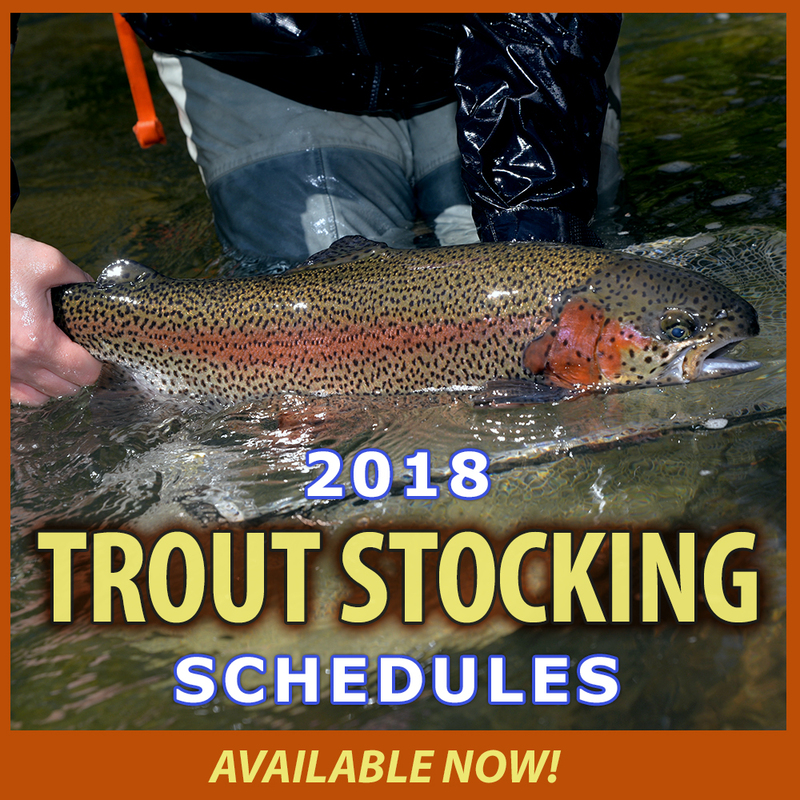 Included in this year’s stocking lists are the Keystone Select Stocked Trout Waters, a program where 21 streams across the state are stocked with large 14” – 20” trout. Under the program, approximately 6,500 large trout will be distributed among the 21 streams. The trout will be stocked at a rate of 175 to 225 per mile, which is comparable to the numbers of similarly sized fish in Pennsylvania’s best wild trout waters. Click here to see the list of waters. The most up-to-date stocking information may always be found on their website at www.fishandboat.com. If you’d like a hard copy of the schedule we have them at my offices, but please note that dates can be changed by the Fish and Boat Commission due to weather and other circumstances. For more than fifteen years the Big Knob Grange, along with Antique Tractor Club, Boy Scouts, and Several Church groups, have sponsored a Pancake, Buckwheat and Sausage Supper. Each year one or more persons are selected who are in serious need of financial help with medical bills. Over the years this event has help giveaway more than one hundred thousand dollars to families in need. This year the funds will go to help Chuck Hortsman, a youth pastor of Burry’s Church in New Sewickley, and Josh Simon, a local landscaper. The Tractor Club men and women make the sausages, the Boy Scouts bus tables, Churchgoers provide a bake sale, and the Grange members help with a silent auction. This year’s supper will be held on Tuesday February 13th from 3-7pm. The cost of dinner is $8 for adults and $4 for children. If you would like to donate to the dinner or an item for the auction please contact 724-316-6628. Keep Pennsylvania Beautiful has been around since 1990. Its mission is empowering Pennsylvanians to keep our communities clean and beautiful. Volunteers have removed over 126 million pounds of litter from Pennsylvania’s roadways, greenways, parks, forests, and waterways. Keep Pennsylvania Beautiful has announced that registration for the 2018 Great American Cleanup of PA is open. This annual event begins on March 1st and ends on May 31st. During this period, registered events can get free trash bags, gloves, and safety vests from PennDOT district offices, as long as supplies last. Events can be litter cleanups, illegal dump cleanups, beautification projects, special collections, and education events and must be registered through the Great American Cleanup of PA website, www.gacofpa.org to receive free cleanup supplies. As part of this event, the Pennsylvania Department of Environmental Protection and Pennsylvania Waste Industries Association are sponsoring Let’s Pick It Up PA Every day from April 7th through April 30th. During this time, trash collected at registered events can be taken to participating landfills free or for a reduced cost with prior approval. During the 2017 Great American Cleanup, the value of costs avoided or money saved by municipal, county and state governments was $13 million due to generous donations of supplies, services and manpower. The event engaged 132,695 invaluable volunteers in 7,280 events across the state. 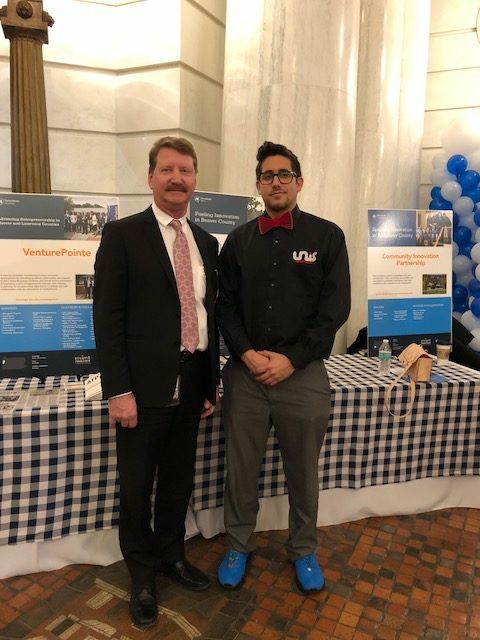 Had a chance to talk to Nicholas Unis a Penn State student from Center Township at the Capitol. Check out his sneakers, he made them from a 3-D printer. The Alzheimer’s Association Caregiver Support Group is offering support to those caring for someone with Alzheimer’s or related dementia. The support group meets to learn about local community resources, find solutions to challenging behavior and learn practical caregiving information. They met the first Wednesday of the month from 6pm to 7pm at the Ellwood City Hospital Cafeteria Back-Dining Room. To RSVP please call 724-544-9845. RSVP is not mandatory and no one will be turned away. If you’re in need of Pennsylvania state tax forms we carry all the forms at my offices. These include PA-40, instruction booklets, envelopes, and Property tax/Rent Rebate booklets. The 2017 Property tax/Rent Rebate booklets are for senior citizens or disabled individuals who make under $35,000 a year, if they are a property owner, or under $15,000, if they are a renter, while only counting 50% of social security as income. If you’d like more details regarding state tax forms or the Property Tax/Rent Rebate you can call my office at 724-774-0444 or visit the PA Department of Revenue website at this link.